Prospect of new resort and high-rise hotels within the port authority. A reverse countdown is underway for a closely watched meeting by a shipping ministry-related committee that will, to a large extent, determine whether Cosco's master plan for the Piraeus Port Authority (PPA) is approved, naftemporiki.gr reports. The state-owned Chinese multinational port and shipping giant assumed the management of PPA in August 2016 after winning an international tender for the sale of a majority stake (66 percent) of Greece's largest and busiest port facility. The latest reports point to a session by the relevant ports committee by the end of February. The highly ambitious plan by PPA's management aims to enhance the port's growth prospects through an expansion of activities are not are directly linked with port operations, although it has generated reactions by political parties - mostly on the left - surrounding municipalities and local chambers of commerce. Unofficial negotiations during the recent period between PPA officials and the leadership of the shipping and environment ministries over specific projects in the master plan have reportedly failed to bridge differences. According to sources that spoke to "Naftemporiki", the Tsipras government's proposal calls for the draft master plan to be broken up into two parts, with the first including all of the projects specified in a framework contract between Greece's privatization agency (HRADF) and Cosco. The second part of the agreement would include "non-obligatory" projects, mostly the ones that have attracted opposition, such as a new shopping mall within PPA's premises, hotels and even high-rise construction. However, the same reports point to PPA's flat refusal of such a "two-part" compromise. The Cosco side has more-or-less responded with a terse three-word "all or nothing" counter-proposal. At the same time, PPA has kicked off a campaign to persuade at least some of the opponents of its 500-million-euro master plan to change their minds. The fiercest opposition centers on the prospect of a new mall being constructed next to a new 120-million-euro cruise ship hub, despite the fact that the latter project has been temporarily blocked by legal challenges from contractors, who lost out in a tender for its construction. Furthermore, chambers representing Piraeus' traders and shop owners are loath to allow the construction of a mall within the port authority and next to where tens of thousands of cruise ship passenger enter and leave on a seasonal basis. Conversely, "Naftemporiki" has collected data and initial forecasts showing that the total outlay - roughly 200 million euros - for a new cruise ship hub will require additional commercial exploitation, beyond just cruise ship arrivals and home porting, in order to cover the total investment. PPA sources also promised a mall with "high-end" stores and outlets catering to more high-end cruise ship passengers, and therefore, not direct competitors with Piraeus' merchants. Another major source of opposition to the master plan is Cosco's intent to build and manage a new logistics center on a 12-hectare tract of land adjacent to the Keratsini municipality. According to reports, the municipality's current administration opposes the project, saying it will further burden an already industrialized district, while other reports cite opposition by the relevant transports ministry. The leftist government, with the aforementioned ministry in particular, has emphasized and promoted a project to build and run a massive logistics center in the Thriasio industrial district, due west of the Piraeus port. 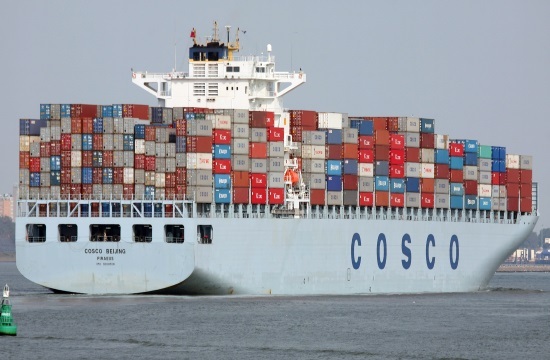 Cosco, nevertheless, wants its own logistics hub within its port premises. The other highlight of the master plan that has stirred reaction is the prospect of new resort and high-rise hotels within the port authority. The ministry's compromise is to permit, in the first phase, for the renovation of current buildings - mostly unused - as hotels, with new construction coming at a later phase. Cosco, yet, considers new hotels within the PPA as a fundamental component in its cruise policy, with planning leading all the way to Beijing, given that Piraeus is considered as a choice destination for Chinese tourists choosing Mediterranean cruises for their overseas holidays. Finally, strong opposition has been expressed by repair units and smaller shipyards in the Perama district to the prospect of Cosco building a 8,500-ton "synchrolift" within the port authority. Standing opposition by ship repair and maintenance contractors to any shipyard license for PPA is adamant, considering that the sector believes that such unit within the port authority would exterminate competition.